Beech is a naturally attractive and distinctive wood, with a warm pinkish hue and unique grain pattern. 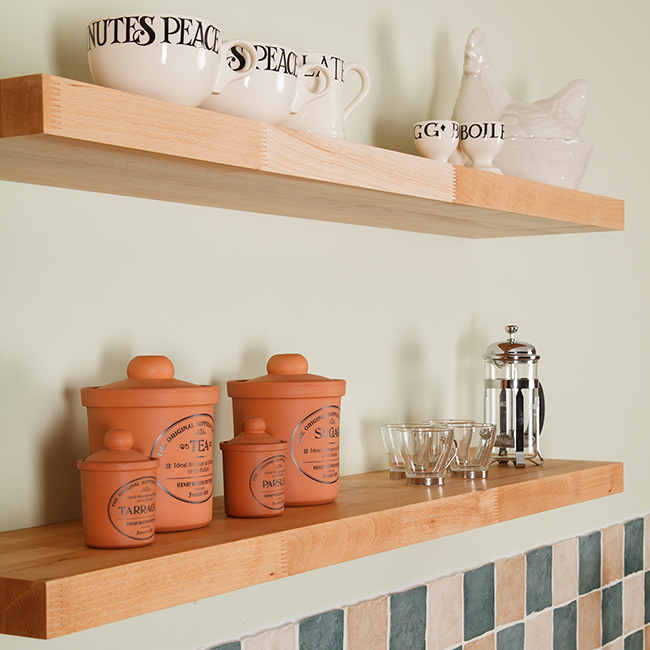 Our beech floating shelves look incredibly impressive and — to save you time and effort — come pre-drilled and supplied with the specialist fixings for creating the magnificent floating effect. Our skilled team have extensive experience working with wood, and utilise the latest technology to cut these beech shelves with maximum precision. The shelves are then carefully sanded, and coated in protective oil, which accentuates the attractive natural grain of the wood. Just like our beech worktops, these floating solid beech shelves are provided with a contemporary square edge profile — the perfect complement to the modern design of floating shelving. We also produce these shelves using the same solid beech staves, which are finger-jointed and glued under high pressure to ensure a strong and reliable bond. All of our floating beech shelves are supplied with the number of specialist brackets required to support their weight: two for 300mm and 600mm shelves; three for 900mm and 1200mm shelves; and four for the 1500mm-long shelves. These fixings are hidden once the shelves have been mounted. Solid beech shelves are substantial, and we recommend fixing the supports to a sturdy stone or brick wall; if you have a partition wall, we strongly suggest attached the supports into the timber studs for optimum stability. As with all wooden furniture, our beech shelving occasionally showcases small knots or splits; these are a natural development that form part of the innate natural beauty of the timber. are an impressive feature for any kitchen or office.